The temperature dropped into the upper 40’s last night. Although the temperature in the bus only dropped to about 64 degrees F I was cold and did not sleep soundly. The electric heater pad is still on the mattress but was not plugged in so I could not use it. Linda developed a bad sore throat during the night (there are no good ones) and also did not sleep well. We got up around 7 AM and I made coffee while she got dressed and drove to the nearby Martin’s supermarket for Ibuprofen and Chloraseptic throat lozenges. Sore throats are no fun. We both hope this passes without requiring medical intervention. 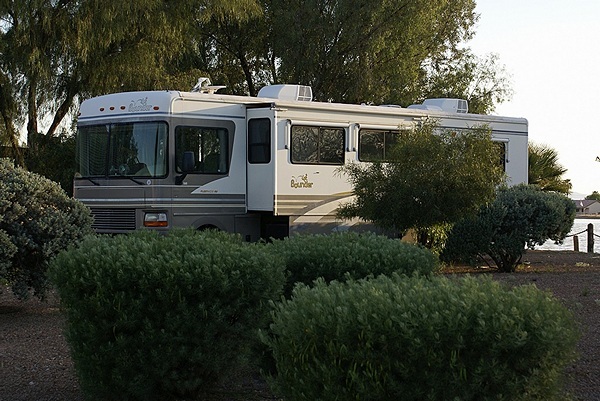 We are in the newest section of Elkhart Campground which consists of narrow pull-through 50 Amp full hookup sites that are long enough to leave a towed car connected to a 45 foot motorhome. The section is not full but the motorhome on our passenger side had their GLAMARAMA 2015 parking and volunteer placards in the window this morning. We finally opened our registration packet and found that we also have a volunteer placard since Linda is volunteering at the registration table. We also discovered that we could have arrived at the Fairgrounds this morning and stayed for no charge. Oh well, Elkhart Campground is more convenient to Bradd and Hall and other Elkhart area vendors and if we checked into the rally we would immediately be working and socializing instead of shopping. One must be clear about their priorities. Bradd and Hall is open from 9 AM to 5 PM Monday through Friday. We got there around 9:45 AM and had just gone inside when I got a call from Curtis Coleman. We was headed east on I-80 from Iowa with his sights set on Cleveland and Columbus Ohio and did not realize we were in Elkhart. He brought me up-to-date on some things having to do with RVillage and we discussed him coming to our house to hang out once he had taken care of some business later this week and we got back home from the rally. At Bradd and Hall we were assisted by Stephanie. Bradd and Hall had a good selection of Flexsteel Captain’s chairs and Lambright Comfort Chairs but did not have any Flexsteel barrel chairs. That was more than disappointing as we thought the Flexsteel bolt down barrel chair might be just what we need to provide seating, with seat belts, on the passenger side of the coach that can swivel to face anywhere from forward to aft. They had two Flexsteel Captain’s chairs that we found comfortable enough and were not too large. Either one might do nicely to replace the front passenger seat, and possibly to replace the driver’s seat, although I am holding out for an ISRI air-suspension driver’s seat. We took cell phone photos of each of us sitting in various seats, photographed product tags, and got several fabric samples but were no closer to a decision about seating when we left than we were when we arrived. On the drive back to the campground we stopped at Factory RV Surplus to look for some electrical components but ended up looking at furniture. They had a barrel chair that we liked but no identifying information on it. We did, however, get some free popcorn. We were headed up SR-19 and decided to go on up into Michigan and pay Michelle Henry a visit at Phoenix Paint. There did not appear to be anyone around so we left and went back to our coach and had a bite of lunch. We had planned to also visit Lambright Comfort Chairs in Shipshewana, but we had been there before and figured they would not have anything different from what Bradd and Hall had on display. With both of us being tired and Linda still not feeling well we decided to stick around the bus and continue to do online research. Sometime during the afternoon I got a call from Jim Marin wanting to know where we were parked. From our windshield I could see their motorcoach parked up by the office waiting to come into the campground. The space to our passenger side was vacant so they registered for that one and pulled on around and in. Jim and Lydia have a 1997 MCI 102DLS-3 Vantare conversion that they bought last September. It’s a nice coach and they got a good deal on the purchase. They got plugged in and set up while we connected our car for towing and then we stood around visiting in the cool temperatures and warm sun. We were showing them what we have done to the inside of our coach and explaining what we plan to do when there was a knock on the door. It was Curtis Coleman. He had decided that Elkhart was far enough for one day and knew we were here as a result of our conversation this morning so he pulled in for the night and was parked one spot up from Jim and Lydia. We made introductions, finished looking at our coach and then toured Jim and Lydia’s bus. I brought my tape measure and tried to quantify the size of their furniture which appeared to fit very nicely in the available space. All of us then went to Curtis’s coach, which is also a 1997 Vantare conversion of a Prevost XL, and got a sense for his seating. Both coaches have ISRI driver’s seats and both Jim and Curtis really like them. We had eaten dinner earlier so Marin’s returned to their coach for their evening meal and we left Curtis to tend to Augie Doggie and take care of RVillage business. Curtis came over later to visit and we sat in our coach in three lawn chairs and had a great chat. He returned to his coach at 10:45 PM and we went to bed a short time later. It was forecast to drop into the mid 40’s overnight so I closed the roof vents and turned on the electric heater pad on my side of the bed. This entry was posted in Family-Friends-Home, FMCA, GLAMA, GLCC, Indiana, Michigan, RV Rally, RV-Travel and tagged Augie doggie (Curtis Coleman), Bradd & Hall (Elkhart IN), Curtis Coleman (RVillage), Elkhart CG (Elkhart IN), Factory RV Surplus (Elkhart IN), Flexsteel 591 Captain's Chair, Flexsteel Barrel Chair, Flexsteel Captain's Chairs, Flexsteel RV furniture (Bradd & Hall), ISRI 6800 series bus driver seat, Jim & Lydia Marin (GLCC), Lambright Comfort Chairs (Shipshewana IN), Lambright Lazy Relaxor Lite, Martins (Elkhart IN), Phoenix Paint (Edwardsburg MI), Stephanie (Bradd & Hall), temporary RV furniture on 2015/06/01 by BRF. I spent most of the day and evening processing photos, although I took time to dump the holding tanks and fill the fresh water tank. Linda and Val did Laundry and then went grocery shopping after which Linda started preparing the inside of our coach for travel. It was a long, busy, productive day but it was mostly chores and work, so not much to write about. We did, however, sign up to be staff at the July 2016 Escapade in Essex Junction, Vermont. I signed up to be the assistant staff photographer again while Linda signed up for any job that was in a quiet environment so she can hear. We really do enjoy the Escapade rallies. Sunset as viewed from our campsite at the Pima County Fairgrounds near Tucson, AZ. Today was our scheduled departure date but we did not need to vacate the Pima County Fairgrounds until noon. We would be caravanning a relatively short distance with Lou and Val and targeted 11 AM for our departure. The more time we spend in our bus the less anxious we are the night before we are going to move to a new location, but there is still a certain anticipation about it. Moving the bus is not like getting in a car to go to work. It’s a big, complicated, machine and there are many details to attend to before we can move it. It also rarely travels the same route twice so we spend time researching and planning travel routes. 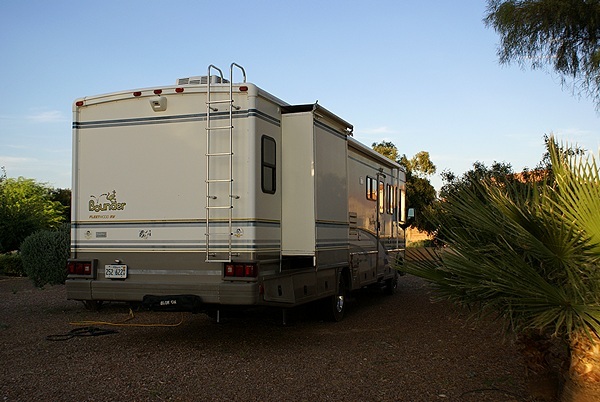 Fortunately, we enjoy these aspects of the RV lifestyle and had most everything in order by the time we went to bed last night. We both slept well enough having worked and played fairly hard all week. We had a leisurely morning and took care of the final preparations for travel. As it was getting to be 10 AM we had to ask someone to move a car so we could pull out. Paul Evert’s RV dealership had moved some of the rigs they had sold during the rally to the full hookup area where we were camped all week and had folks pull there trade-in units there so they could transfer their belongings. As a result the area was getting crowded and obstructed with cars parked wherever it was convenient (for the owner). The RV Driving School was also busy in one of the parking lots near us teaching people how to turn, back up, and park, including teaching the “spotter” (co-pilot/navigator) how to give hand signals to the driver. (This is actually the more difficult job requiring judgement, proper positioning, and clear/timely signals.) As long as the driver can see the spotter all they have to do is follow directions. Many of the Escapade staff were still at the fairgrounds and attendees who signed up for HOPs (Head Out Programs) were still camped there as well. The HOPs are organized outings that sometimes involve a tour bus for transportation, a tour leader/guide, admission to one or more venues, and possibly food. We pulled out roughly on time with Lou and Val right behind us. We headed out of the fairgrounds and then north on Houghton Road to I-10 where we headed west. They needed fuel so we took an exit on the west side of Tucson where there was supposed to be a truck stop, but it wasn’t there. Lou pulled into a station where we could not get in/out so we found a spot a little farther down the road where we could turn around and waited for them to pull out of the station. We followed them back on to the highway and then retook the lead. We exited at Eloy where there were both Pilot and Flying J truck stops. We topped up our diesel tank while Lou filled their propane tank. We got back on I-10 for another eight miles and then exited at Sunland Gin Road and headed south into Arizona City. A few miles, and a bunch more minutes, later we pulled into the rental property that currently serves as Curtis Coleman’s residence and headquarters for the RVillage social network. Good things are happening for RVillage and it was good to be back here to spend a little more time with Curtis and his adorable dog Augie, a Bevar (sp? may be Biewer) Yorkshire Terrier. A panoramic view looking west from the deck of RVillage World Headquarters. It was very peaceful here. We got settled in and then visited a bit. We eventually went to Duffer’s Restaurant at the golf course and then went back to the house for movie night. The film for this evening was “The Social Network” about the founding of Facebook; a most appropriate choice given where we are boondocked. 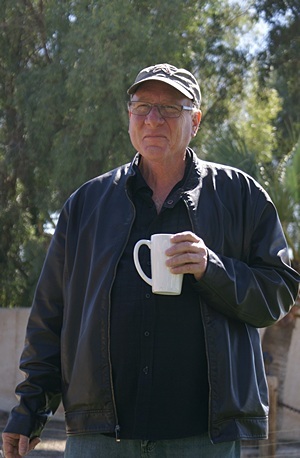 Someone at the Escapade told Lou about a road that runs between Florence and Kelvin Arizona. They said it was mostly good gravel and very scenic and Lou was determined that we find it, drive it, and photograph it. Linda and Val packed a picnic lunch while Lou and I prepared our photography gear. I grabbed the Garmin GPS out of our car (just in case) and we took off, leaving Curtis some peace and quiet to attend to RVillage. I managed to navigate us to Florence where we decided it would be prudent for Lou to top off the fuel tank in his truck. We pulled into a Circle K (Kangaroo?) and took care of that. When Lou tried to start the truck the starter would not engage. It would turn but made a really bad grinding sound. Sometimes the throw-out gear binds and we tried tapping on the starter with a long stick and hammer but it did not help. The starter had just been replaced a month ago in Mesa, Arizona and had a 60 day towing policy in addition to the parts and labor warranty. 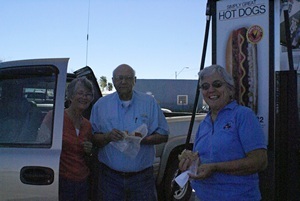 Val, Lou, and Linda having lunch by the fuel pump island at the Circle K in Florence, AZ. Lou called the repair shop and they dispatched a tow truck. I then called Curtis to see if he could fetch Val, Linda, and me from the Circle K and he graciously agreed to come get us. We let the station attendants know what was going on and they were cool with the whole thing even though we were blocking one of the pumps. It took a while for the tow truck to arrive so we ate our lunch standing in the shade at the end of the fuel island. We must have made an interesting sight to passersby. The tow truck eventually arrived, pulled the pickup truck up onto the flatbed, and drove off with Lou riding shotgun. A little while later Curtis arrived. We loaded our picnic supplies and camera gear into the back of his SUV and he drove us back to his place. 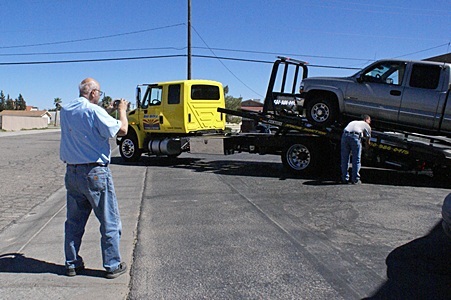 Lou photographs their pickup truck being loaded onto the flatbed hauler at the Circle K in Florence, AZ. I expected to get a call from Lou letting me know that I needed to drive to Mesa to pick him up. What we got instead was a call that the truck was repaired and he was on his way back. The problem was that the starter mounting bolts had not been torqued tight enough and had backed out about 1/4 inch. As a result the throw-out gear was pushing the starter back rather than engaging with the gear teeth on the flywheel. As we thought about it we were realized we were very lucky this did not happen on the road from Florence to Kelvin. Bonnie was also staying at the RVillage compound and joined us for dinner last night. This evening we did a pot luck thing and dined at the outside table by the lake. 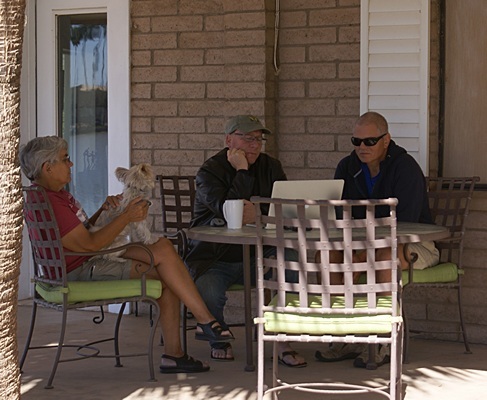 This entry was posted in Arizona, Escapade, Family-Friends-Home, Landscape, People-Events, Photography, RV Rally, RV-Travel, RVillage, SKP and tagged 55th SKP Escapade (2015), Arizona City (AZ), Augie doggie (Curtis Coleman), Bonnie Morris, Circle K (Kangaroo) filling station, Curtis Coleman (RVillage), desert sunset, Duffers Bar & Grill (Arizona City AZ), Florence (AZ), Florence to Kelvin Road (AZ), Garmin 465T GPS, I-10 (AZ), Lou & Val Petkus, Mesa (AZ), Paul Everts RV Country, Pima County Fairgrounds (AZ), Prevost H3-40, RV Driving School, SKP HOPs, starter (Chevy pickup truck), tow truck on 2015/03/16 by BRF. World Headquarters of the RVillage Social Network and residence of founder/CEO Curtis Coleman. We pulled into the driveway yesterday of the house that currently serves as the World Headquarters of RVillage and home of the founder/CEO Curtis Coleman. Forrest and Mary Clark were already here and Randy Sturrock and Marianne Edwards, who run Boondockers Welcome, arrived about 20 minutes after we did. Augie doggie strolling on the sidewalk by the lake. We were not in a rush to get up this morning, made coffee once we did, and enjoyed the lovely grounds and the view of the lake. Curtis had work to do, some of which involved Randy and Marianne, so we visited with Forrest and Mary and just relaxed and read or worked on our iPads and computers. RVillage founder/CEO Curtis Coleman at work on his patio office. By lunchtime Forrest and Mary had left, followed by Randy and Marianne. Not long after that Dave and Vicki McKenna arrived. They handle membership for the Escapees RV Club SKP Boomers BOF, so it was nice to finally meet them. We all had a nice chat with Curtis and then left him to work. 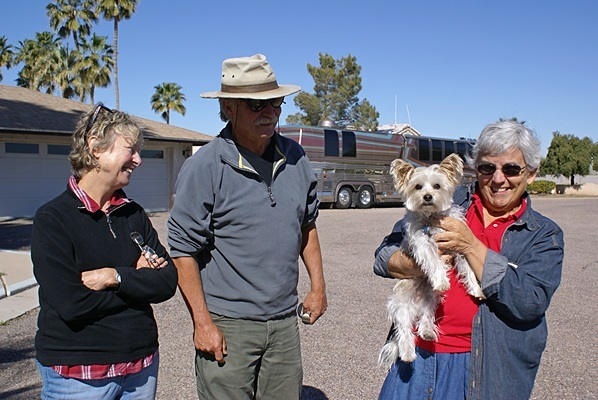 Forrest and Mary Clark visiting with Augie by their Foretravel motorhome. The five of us went to dinner at Duffers, the bar/grill/restaurant at the local golf course. Linda and I had nice garden salads with fresh ingredients and a basket of sweet potato fries. We sat and talked until we were the only folks left in the restaurant. We took the conversation back to the house and continued it there much later into the evening than is normal for us. Linda holds Augie for a beauty shot. We spent the morning visiting with Curtis Coleman (RVillage) and Dave McKenna (SKP Boomers BOF) and then started getting ready to leave. We turned the bus around, hitched up the car, and finally pulled out around 1 PM. 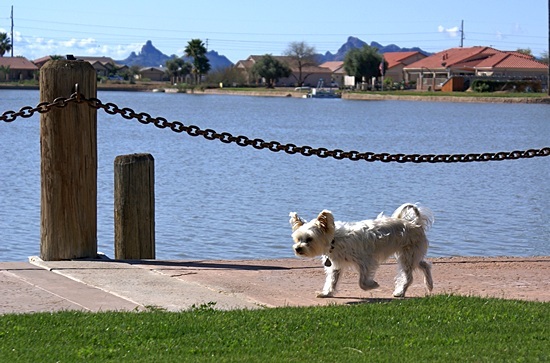 We had a relatively short drive of just over 50 miles to get to the RV Park in Tucson where we had a reservation. Marianne Edwards and Randy Sturrock with Linda (holding Augie). We had an easy run with good access to the RV Park. 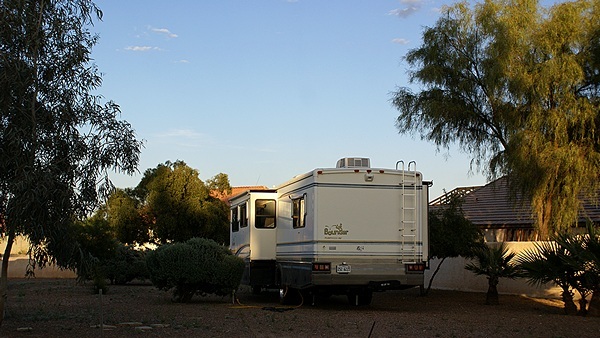 Tucson is not a kingdom, and it does not have royalty, but it does have a street named “Prince” and it has an RV Park at the end of that street by I-10 named Prince of Tucson RV Resort. The park was clean and attractive enough and there were some aspects of the park that were better than usual, especially the road leading in and the check-in lanes. It was right up against a retaining wall for the entrance ramp to eastbound I-10 which we thought might be a noise problem, but it wasn’t. The pull-through spots, which are intended for overnight guests, were very narrow, but they had full hookup 50 Amp service and were easy to pull out of when leaving, so they served their purpose. 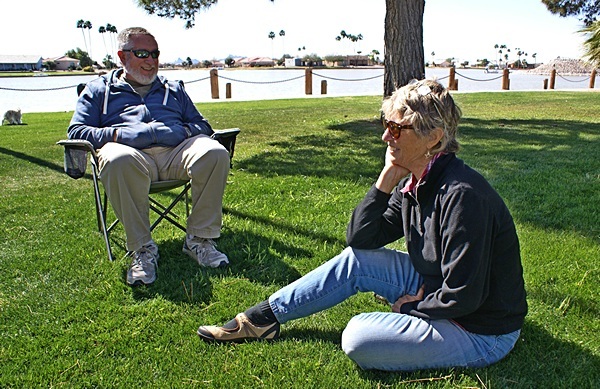 Lou and Val Petkus were going to stay at Prince of Tucson but changed their plans and stayed at a Passport America park just on the other side of I-10 from us. We called to let them know we were in and see if they wanted to go to dinner. They were both tired and settled in so they took a pass on dinner. We needed groceries so we unhooked the car and drove to a Whole Foods Market about 8 miles away and stocked up on some items that are difficult to find elsewhere. Forrest Clark and Marianne Edwards talking on the lawn at RVillage WHQ. Back at the rig we got the groceries put away. We then scanned for TV stations and found some!!! 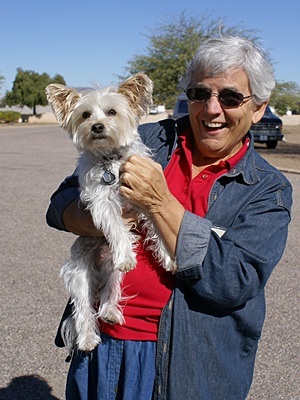 We could not receive OTA TV in Quartzsite and were not able to pick up any stations in Arizona City, either. Linda, Curtis, and Dave McKenna discussing details of RVillage. This entry was posted in Arizona, Family-Friends-Home, RV-Travel, RVillage, SKP and tagged Arizona City (AZ), Augie doggie (Curtis Coleman), Curtis Coleman (RVillage), Dave & Vicki McKenna (SKP Boomers BOF), Duffers Bar & Grill (Arizona City AZ), Forrest & Mary Clark, Lou & Val Petkus, OTA TV, Prince of Tucson RV Resort, Randy & Marianne (Boondockers Welcome), RVillage, RVillage Ambassador Program, RVillage World Headquarters, Whole Foods Market (Tucson AZ) on 2015/03/05 by BRF. I had coffee and toast for breakfast. That finished the sourdough bread, which lasted two weeks, and the strawberry preserves, which had been around a lot longer than that. I spent most of the rest of the morning cleaning the inside of the coach, specifically the tile floor, and putting things away so that there was someplace for two people to sit. The floor and kitchen counter looked better than they have most of the time Linda has been away. 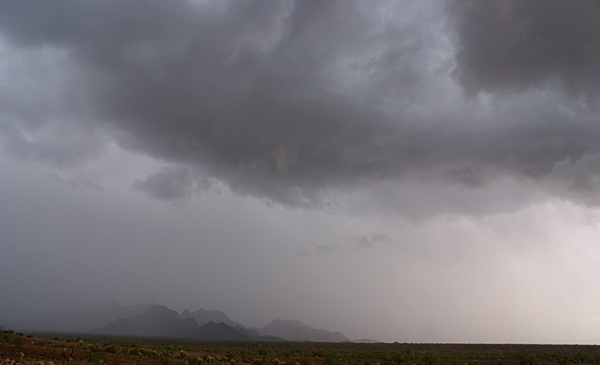 Heavy rain over the mountains and desert east of Quartzsite and south of Plomosa Road. I left a little after 11 AM to drive to Sky Harbor International Airport in Phoenix. Linda’s flight was scheduled in at 2:35 PM MST but was delayed on departure with a revised ETA of 2:56 PM. The weather was overcast with intermittent rain; something we have not seen much of since we arrived here in early-mid December. It is approximately a two hour trip from Quartzsite to the airport so that left me two hours to take care of two shopping errands. That seemed like plenty of time but I had not calculated in the time required to deal with Sunday noon traffic at a major shopping location. I needed cat food and had an address for a PetSmart. I also needed a GE water filter and had an address for a Home Depot. As I approached the Dysart Road exit on I-10 I saw a Home Depot. It was not the one I had programmed in my GPS, but it was right there. Little did I know that the area around that exit was a massive shopping complex that felt like square miles of retail stores. The Home Depot did not have the GE housing or filter element I was looking for, even though I bought it at a Home Depot in Logansport, IN. I no sooner got on the highway when I saw the sign for a PetSmart on the north side of I-10. I took the next exit and doubled back. In retrospect I should have taken W McDowell Road and snuck in (and out) the back way but I had no way of knowing that in advance. They had the Hill’s Science Diet Sensitive Stomach and Skin cat food and I bought a 20# bag. There was a Lowe’s on the same (north) side of I-10 on the west side of Dysart Road so I went there looking for the GE water filter but they also did not have it. Although I still had plenty of time to get to the airport the delays associated with dense shopping traffic and finding stores led me to abandon my quest for a new water filter. I didn’t really need it anyway as the filter in question fits in a GE inline housing under the kitchen sink and provides the final filtering for our drinking and cooking water. It’s a 1 micron cartridge that filters for at least five different classes of things and costs $35 – $40 as I recall. I think it is supposed to be good for six months of ‘normal’ use. Our filter has been installed for about four to five months, and has not had that much water run through it, so it should be good for quite a while yet. I got to the west cell phone lot at 2:38 PM, about the time Linda’s flight was originally scheduled to arrive. I knew it was delayed because she texted me when she boarded. I checked the status on my smartphone and it showed the flight arriving at 3:10 PM. It was a bit latter than that when Linda texted that they had landed. She called me from the terminal at 3:30 PM and I headed for Terminal 3, Door 5. I missed the pull-off and then missed the turn-around, ending up six miles east of the airport before I could exit and head back. I called Linda to let her know but she saw me drive by and knew I was out there somewhere trying to get turned around. Fortunately the airport was easy to get back to and this time I pulled in to the correct place, looped around, and picked her up. Another loop-around and we were headed back to I-10 West. The first serious weather we had was on our last full day in Q.
Linda picked up a bug yesterday, perhaps just a cold, but she was obviously tired and not feeling well. She dozed off and on the whole trip back to Q. The weather had lifted a bit, with the sun occasionally peeking through the clouds, but closed in the farther west we traveled and we encountered light but steady rain for the last 60 miles. The skies were especially dark, and the rain heavier, as we cleared the last mountain range and made the long descent into the La Paz Valley and took exit 19 into the east end of Quartzsite. I stopped at the Road Runner Market for a bag of salad greens, sandwich bread, and bananas and then headed to our coach. It was cool in the coach so I made some hot tea. I fixed a big salad for dinner after which we were not hungry enough to have soup. Linda went to bed early while I checked e-mail and then worked on my blog post for the third week of January. I took a lot of photos that week and did not have enough time left to make selections, process them, and upload the post. I won’t have time to work on it tomorrow but I will try to finish it on Wednesday and upload it. Today was our last full day in Quartzsite, Arizona unless something prevents our departure tomorrow morning. After our usual breakfast of coffee, juice, and granola we filled out our mail forwarding form for the P. O. Box, signed our tax returns, and got them ready to nail. We left around 9:15 MST for the post office. There was a line so we decided to come back later and headed for the UPS Customer Service Center in Blythe, California. The center is only open for will call pick up from 9 to 10 AM PST Monday through Friday. We pulled into the parking lot at 8:57 PST and were second in line behind a couple from Alberta, Canada. I retrieved my package and then had a nice chat with the other couple in the parking lot. We stopped at Albertson’s for cat litter and a few other sundry items and then headed back to Q. We stopped at the RV Lifestyles store to buy a repair kit or replacement for the fresh water tank blade valve. They had both 2″ and 1.5″ and I did not know which one I needed so I left empty-handed. By then it was after 11 AM MST and we avoid the Post Office between 11AM and 1 PM as those are the hours for General Delivery pickup. I stopped at the Union 76 station just behind the post office and topped off the tank before heading back to our motorcoach. Another view of the storm. We spent the next four hours straightening up the interior of the bus. Linda sorted through all of the brochures and guides we had picked up and designated most of them as trash. I consolidated bus parts in cardboard boxes and put them in the car. I cleaned out the storage space under the bed and we pulled out the air pump for our old Select Comfort air mattress. The pump went in a big bag and we took it over to Butch and Fonda along with some literature on things to do in/around Yuma. I reorganized the space under the bed which created room for us to store things. At 3:15 PM we drove back to the Post Office. There was a line but it was short and was moving along. We turned in our mail forwarding form, put postage on a letter to the FMCA Freethinkers chapter treasurer, Dan Fregin, and mailed our federal and state tax returns certified mail with electronic tracking. Back at camp Linda put a load of laundry in the washing machine. Fonda had taken Butch to pick up a “desert bug.” He found a 1969 VW bug for sale that had been modified to be an ATV. Butch drove it to Bouse with Fonda following him and we made the trip a short time later. We got to see the dune buggy and the park where they will be the working next season as the managers. On the drive back to Q we drove through some heavy rain and pulled over at one point on Plomosa Road to take pictures. We stopped again on AZ-95 to photograph brilliant white RVs against the very dark storm clouds and then finished our return trip to Q. Linda and Fonda had left a few items on the clothesline to dry when the rains came through so she put them in the dryer. The laundry was done by 6 PM and we headed over to Crazy Jerry’s for our last meal together for a while. I got a call from Lou Petkus. He had just found out that they are supposed to be at the fairgrounds on Wednesday rather than Friday. He wanted us to check our e-ticket which Linda did back at the bus. We were definitely setup for Friday entry which means we will not be able to enter and park together. On the drive back we scouted out places to hook up the car and decided the ARCO station on the east end of town looked like out best bet. I had e-mails from Stacy indicating that she had finished proof-reading two more of my articles. I retrieved them from our Dropbox and did the final editing on them while Linda streamed the last episode of Downton Abbey for the season on her iPad using our Verizon MiFi. She went to bed to nurse her cold and I uploaded the final versions of the two articles and also updated/uploaded my article tracking spreadsheet. I then headed off to bed too. 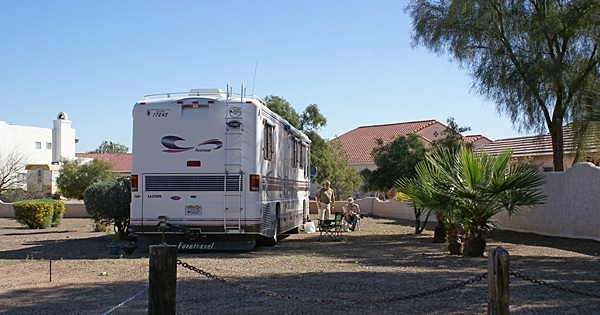 We arrived in Quartzsite, Arizona on December 12, 2014 with Butch and Fonda Williams and got our buses parked at the Liebherr-Brockner lot on the north central end of town. Our bus remained in that spot for 80 full days and was there for all or part of 82 days. We were up at 7 AM to have a cup of coffee and some granola early enough to have time to digest it before we hit the road. After breakfast I dumped the holding tanks, flushed out the drain hose, and stowed it away. We were down to 1/2 tank of fresh water so I topped it up. I then disconnected the water softener and all of the hoses and filter housings that go with it and stowed those away. And another view of the storm. We were aiming for a 10 AM departure so around 9:30 AM Jim L. read the electric meter and calculated our final bill. Linda added in the loads of laundry and wrote a check to cover our obligations. I shut off the power, disconnected the shorepower cord, and stowed it away. I connected the chassis batteries, turned on the air supply valve for the engine accessories, and turned on the air valves for the auxiliary air system accessories. I also checked the oil level in the engine and it was at the ‘full’ mark. Butch and Fonda were also supposed to leave today for Yuma but when they checked on their reservation they were told the rains yesterday had softened the ground and they should wait a day before coming down. Larry and Sandy had not returned from Yuma yet, but Butch/Fonda, Jim/Barb, and Jim L. were all gathered to wish us farewell and safe travels. Jim L. was also there to help me get the bus out of the lot with damaging anything. The engine fired right up, I switched it into high idle, switched the Level Low system to ride height mode, and lifted the tag axle. Once the air pressure was fully up (~130 PSI) I dropped the engine back to low idle and got out to do a walk around, checking the suspension height and securing the bay doors. Linda did her own walk around to verify everything was closed and locked. At that point there was nothing left to do but pull out. Jim L. suggested I back up while swinging the noise gently to the passenger side to get a better angle going forward. I was going to back up a short distance anyway to release the brakes in case they had frozen while sitting. The humidity has generally been quite low here and the brakes were fine. 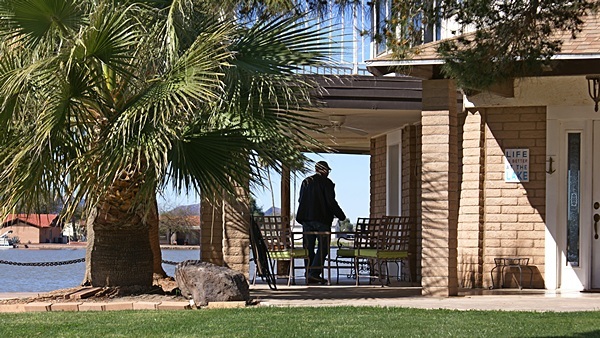 I cut the steer wheels hard to the right (PS) and pulled forward aiming for the gap between the concrete patio pad on the left and the Palo Verde tree and light pole on the right. Jim L. spotted me on the DS while Linda kept an eye on the PS and I made it through with plenty of room to spare. Once clear of those obstacles I pulled up to the left and straightened out. I then backed between the park model trailer on the PS and the cactus garden on the driver side with Linda watching the rear of the bus and the street and Jim watching the front and sides. I backed into the street and then pulled forward so I was not blocking any driveways. I shut the engine off and then guided Linda has she pulled the car up behind the bus. Hooking up the car usually takes 15 to 20 minutes or a bit longer if we gave not done it for a while. We were ready to go for real at 10:35 AM, had one last round of “farewell for now, see you down the road” and finally pulled away at 10:40 AM. Looking east from AZ-95 at part of the Plomosa Road BLM STVA with heavy storm clouds in the distance. I had some concern about the turn from southbound Lollipop Lane onto eastbound Kenoyer with the car attached but Jim assured me it would be fine and it was. We turned south on Central Ave (AZ-95) to Main Street (BL-10) then east to Riggles Road and south over I-10 to the eastbound entrance ramp. I got on the accelerator and the bus responded nicely coming up to speed as I merged onto the freeway. Leaving Q to the east or west involves long, steady climbs of 700 feet and I wanted the speed, RPMs, and turbo boost up going into the grade. All of my gauges indicated that everything on the bus was running well except I wasn’t sure the air dryer was purging. When the air pressure in the system reaches the maximum set point the governor actuates the unloader valves, stopping any additional compression, and sends a pneumatic signal to the dryer to open the purge valve and release any water it has removed from the compressed air. The brief puff of air sounds a little bit like a “sneeze” and is often referred to as such. I always listen for the “sneeze” when the chassis first airs up but did not recall hearing it. As we were driving, however, the pressure in the auxiliary air system cycled between ~100 and 130 PSI, indicating that the air compressor and governor were doing their main jobs. Later, as we were getting ready to pull out of a rest stop, I heard the air dryer sneeze so I finally had confirmation that everything appeared to be working correctly. The other thing that surprised me was that I never saw over 15 PSI on the turbo boost gauge. The old gauge only went to 15 PSI but the needle would routinely go past that to the limit of its movement. I had gathered from the POG and PC forums that 22 to 25 PSI was more like what I should see when asking for maximum power. The drive over I-10 was nice as the recent rain had changed the appearance of the desert. Just before coming to the western edge of the Phoenix metropolitan area we took AZ-85 south. As we did we could see rain to the southeast and wondered if we might encounter some of it. The run down AZ-85 was flat but there were interesting mountains on either side of us. We eventually reached I-8 and got on going east. Much of the drive across I-8 was through the Sonoran Desert National Monument but we could not locate a headquarters for it on any of our maps. We also drove through rain and started to get a glimpse of the desert in spring. Not long into our trip Linda used my phone to text Curtis and give him our ETA. He called back and asked if we could delay our arrival until 3:30 PM as he had a meeting at 2 PM. Linda found a rest stop on I-8 not too far from I-10 so we pulled in there, had lunch, and took naps. It turned out to be a picnic area with no facilities but that was OK with us; we are self-contained and it was a lovely day to sit and enjoy the scenery. The final leg of our trip took 45 minutes. Linda texted Curtis when we exited I-10 at Sunland Gin Road and he texted back that the gate was open. Although wide enough for the bus we decided to unhook the toad before going in. We were going to have to unhook the car anyway as we will have to back up to get turned around when we leave. Curtis came out to greet us, closed the gate behind us and directed us into a parking spot. He let Augie out so he could greet us and run around, which he loves to do. Augie is a small, six year old, white dog who is full of energy but has spent most of his life living in a bus. Having the enormous yard of the house Curtis is renting to run in is very exciting for Augie and he takes full advantage of it. Rainbow colors refract from the rain near the center of this scene. AZ-95 looking NE over the Plomosa Rd BLM STVA. Forrest & Mary Clark were already here in their Foretravel U295 so it was good to see them again. When we crossed paths with them at the RoVers Roost SKP Co-op they were waiting to have solar panels and a charge controller installed. Forrest said they did not run their generator once while boondocking for five weeks near Quartzsite so their system appears to be correctly sized and working properly. Randy & Marianne (Boondockers Welcome founders) pulled in about 20 minutes after us. After greetings and introductions Curtis gave us a tour of what is currently serving as the World Headquarters of RVillage. The house is hexagonal and sits on a bump out into the northeast corner of a man-made lake. The house was originally a bar/restaurant, with the bar on the main floor and the restaurant seating on the second level, which was not enclosed except for railings. The property is extensive because it was once a parking lot. When the restaurant was closed in the early 1990s the owner converted it to a house, enclosing the upper level and dividing it to make bedrooms. 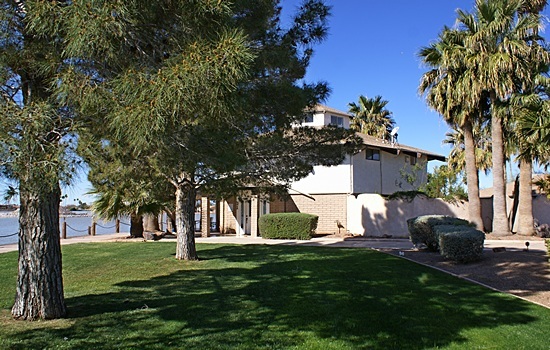 He retained a portion of it as an outside deck that most of the bedrooms open onto. Back on the main floor the central bar was converted to a residential kitchen surrounded by an open floor plan with a generous outside deck. The building still has a functioning walk-in refrigerator that Curtis uses as a pantry. It is an extraordinary property and the driveway could accommodate eight buses as long as the neighbors did not complain. Exciting things are always going on behind the scenes with RVillage so one of the perks of crossing paths with Curtis is hearing about them or even getting a sneak peak at some of them. It is also an opportunity to see the “back end” of the site which has the tools Curtis and his team use to develop and manage the system. After tours and demos we all stood around on the lawn chatting and enjoying the view and the cool evening air. Too soon the air was chilly. Forrest and Mary returned to their motorhome to have dinner while Linda and I did the same thing. Randy and Marianne had business to discuss with Curtis and hung out with him on the deck a while longer. They may have gone out to dinner but we did not see them leave or return. I had turned our generator on to bring the batteries up to charge and so Linda could cook dinner. She made a green salad and red beans and rice, which went well with the Franzia Fruity Red Sangria. After dinner we got our technology set up and got online. Linda is still recovering from the cold she picked up just before flying back to Arizona so she went to bed early. I checked e-mail and saw that Stacy had proofread another article so I made the final edits to it and uploaded it to the READY folder in my Dropbox BCM Articles folder. Since we are boondocking I shut off most of the unessential electrical loads and then shut down the generator for the night. Travel days are exciting but also a bit stressful, especially when we have been sitting in one place for a long time, be that at home or away. But it felt good to be on the road again and to have landed in such a lovely place for the night. It’s harder on the cats, who do not like it when the engine is running and the bus is moving, but they came out of their travel (hiding) spots as soon as we were parked and were fascinated by the change of scenery. We were both tired but it was a good kind of tired. This entry was posted in Arizona, Family-Friends-Home, Landscape, Photography, RV-Travel and tagged Albertson's (Blythe CA), Arizona City (AZ), Augie doggie (Curtis Coleman), AZ-85 S, Bendix AD-9 air dryer (H3-40), Bouse (AZ), Butch & Fonda Williams, Crazy Jerry's restaurant (Q), Curtis Coleman (RVillage), Dan Fregin (FMCA FTH), departure day, departure routine, Downton Abbey (PBS), Forrest & Mary Clark, Home Depot, I-10 E, I-8 E, Jim & Barb Brockner, Jim & Flo Liebherr, La Paz Valley (AZ), Lou Petkus (K9LU), MiFi (Verizon), PetSmart, Quartzsite (AZ), Randy & Marianne (Boondockers Welcome), RVillage, RVillage World Headquarters, Select Comfort air bed, Sky Harbor Intl Airport (Phoenix AZ), Sonoran Desert Natl Monument (AZ), Stacy (BCM), Sunland Gin Road, tax returns, turbo boost gauge (H3-40), U. S. Post Office (Q), UPS (Blythe CA) on 2015/03/03 by BRF.